In 1814, the celebrated Japanese artist Katsushika Hokusai—best known his Thirty-Six Views of Mount Fuji, which included the imminently recognizable Great Wave off Kanagawa—published a 15-volume work titled Manga, containing thousands of illustrations of landscapes, plants and animals, people, decorative ornaments and more. In the mid-1870s, copies of the Manga circulated in France, and the Pillivuyt porcelain manufactory adapted Hokusai’s mouse illustrations for use on a line of tableware. 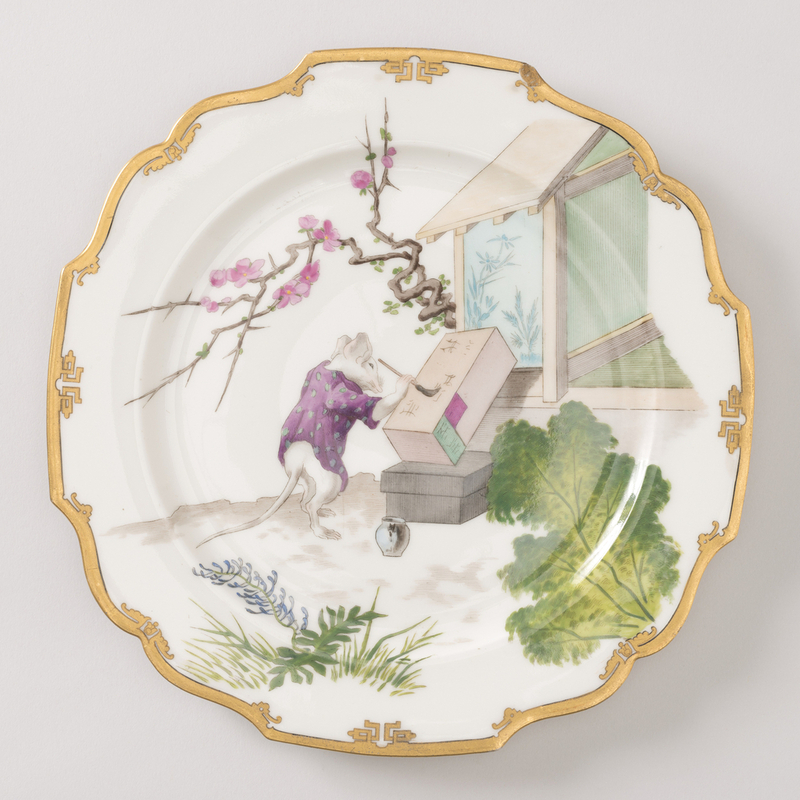 This painted porcelain dessert plate is one of a set of six in Cooper Hewitt’s collection, which also includes a cake stand. The cake stand and four of the plates are now on view in the exhibition The Virtue in Vice. The plates depict mice engaged in various human activities, such as diving and swimming, playing guitar, and hiking. On one plate, a mouse is riding on the back of a large blue fish, while on another a mouse is fanning itself while enjoying a vista of Hokusai’s iconic Mt. Fuji. Surrounding the main scenes are examples of Hokusai’s realistic plant and flower depictions, such as traditional Japanese cherry blossoms, bluebirds, and bamboo. Japanese decorative elements were widely employed on European objects in the mid- to late-nineteenth century, following the opening of Japanese ports by Commodore Matthew Perry in 1854. This dialogue between Western design and Japanese aesthetics is the subject of the exhibition Passion for the Exotic: Japonism, now on view at Cooper Hewitt. Nick Stagliano is a master’s student in the Cooper Hewitt/Parsons History of Design and Curatorial Studies program with a special interest in ceramics. He is a Curatorial Fellow in the Product Design and Decorative Arts Department at Cooper Hewitt. ← It’s Your Deal. Whist, …Five Card Draw?